This entry was posted in Bill's Schedule and tagged increase website traffic, internet marketing, internet marketing seminar, internet marketing show, live broadcast, live marketing show, live show, live streaming, Online Marketing, online marketing consulting, online marketing service, online marketing show, online marketing tips, online-marketing-seminar, Social Marketing, twitter, Video Marketing, viral advertising, Viral Marketing, viral video, youtube, youtube marketing by Bill McIntosh. Bookmark the permalink. 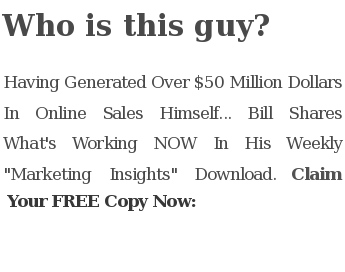 Hi Bill, I really appreciate your viral marketing concept to marketing online. I have created an adsense blog, and I really look forward to sending thousands of visitors to my blog by utilizing the viral concept to explode my affiliate and adsense earnings.